Now that was nothing for people with weak nerves. 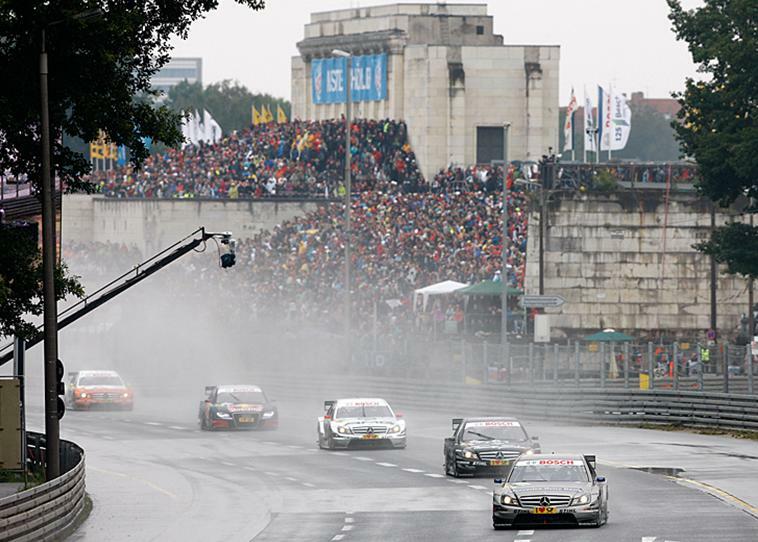 In the fifth season round of the DTM at the Norisring, heavy rain determined the drivers’ tactics. Canadian Mercedes-Benz driver Bruno Spengler did it perfectly. The 27-year old defended his first position from start to finish and thus claims back the lead in the battle for the title. “This was the most difficult race of my life. I am very happy with this victory and the lead in the drivers’ standings. There was so much water on the track, even behind the safety car. Driving like that was incredibly difficult”, said Spengler. For Mercedes-Benz, it was already the ninth consecutive victory at Norisring. During the race, British driver Jamie Green had a great battle with Audi driver Mattias Ekström. He came out on top and completed the 1-2 for the Stuttgart-based manufacturer. Once again, Martin Tomczyk drove a spirited race with his 2008-spec Audi A4 DTM and was able to make his way up from tenth place on the starting grid to a podium finish. The decisive factors were a late first pit stop and another service only two laps later. By finishing third, the Germany still scored six points for the drivers’ standings. Still, Spengler took the lead in the drivers’ standings away from him and, with 39 points, is now three points clear of Tomczyk. “I am always charging, although it was hardly possible in this race because of the heavy rain as we couldn’t see a thing. I tried to drive my race and after my pit stops, I suddenly found myself in third place”, the happy 29-year old said. Tomczyk’s fellow Audi driver Timo Scheider also was able to make up positions and having started from seventh, he finished fourth. DTM rookie Edoardo Mortara (Audi) scored his best season result to date. The Italian finished fifth and came home one place ahead of Mercedes-Benz driver Ralf Schumacher. Two times’ DTM champion Ekström was in third for a long time, but had problems after his second pit stop and ended up seventh. With his AMG Mercedes C-Class, David Coulthard was classified eighth, scoring his best result this season and one point for the drivers’ standings. In spite of the changeable weather, 124,000 spectators attended the race weekend at the only street circuit on the DTM calendar. Due to the heavy rain, the clerk of the course decided to start the race behind the safety car. More rain showers in the closing stages of the race triggered another safety car intervention. Once 75 percent of the race distance were completed and thus full points could be awarded for the DTM race, the clerk of the course decided to stop the race behind the safety car. Remarkable: in spite of the difficult conditions, there was only once accident. Mercedes-Benz driver Gary Paffett, who had started from second place, lost control of his car on lap 16 and hit the wall. Five of ten DTM season rounds having been completed, Spengler is ’half time champion’. Behind runner-up Tomczyk, Scheider is following with 24 points Green with 21 and Schumacher with 17. In a fortnight (July 16th and 17th), the DTM is exploring new territories and presents itself to the fans with a show event at the Olympic stadium in Munich.